/ Best Hot Wings in Destin FL / Landshark’s WINGSDAY only 69¢ each NCAA #1 VILLANOVA vs GEORGETOWN & BAMA vs #17 AUBURN All Bourbons $2 OFF! 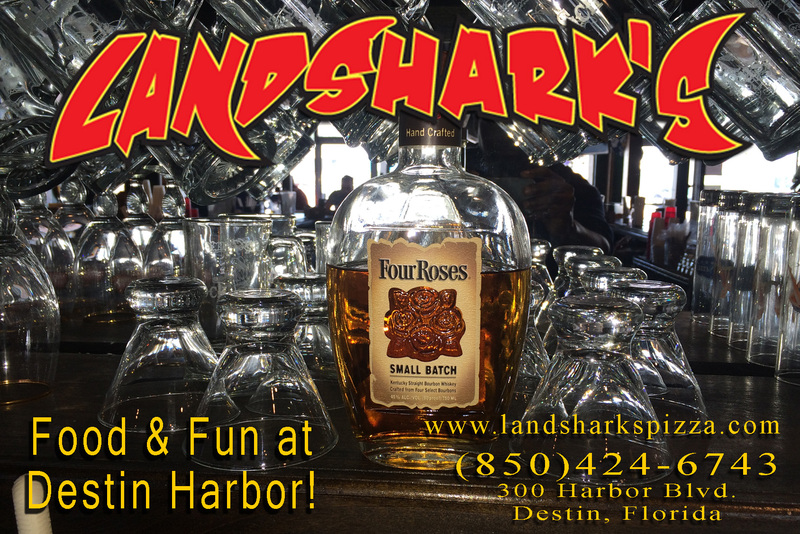 Landshark’s WINGSDAY only 69¢ each NCAA #1 VILLANOVA vs GEORGETOWN & BAMA vs #17 AUBURN All Bourbons $2 OFF! 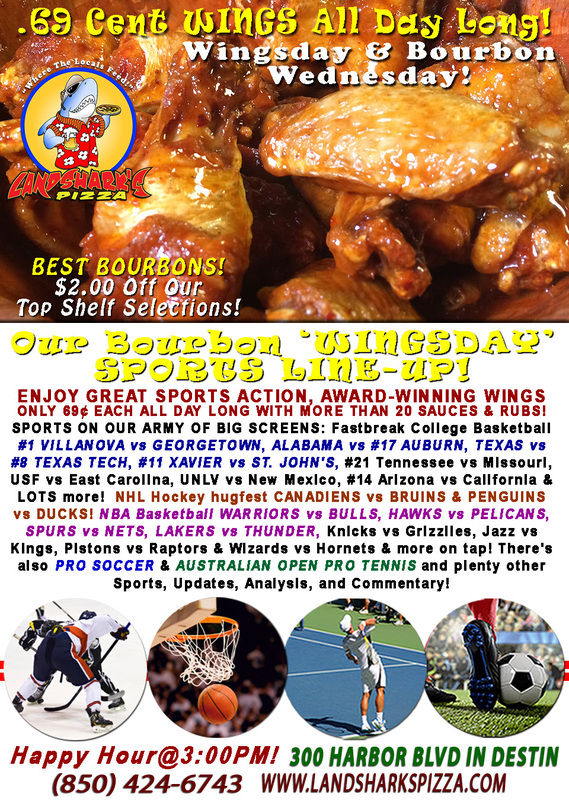 Flaming-hot College Hoops action at Landshark’s Pizza Company in Destin, Florida featuring Wing Wednesday Specials! Slap Humpday around and show it who’s the boss with our juicy & delicious Award-Winning wings for only 69¢ each ALL DAY LONG! Choose from among more than 20 sauces and rubs to compliment! 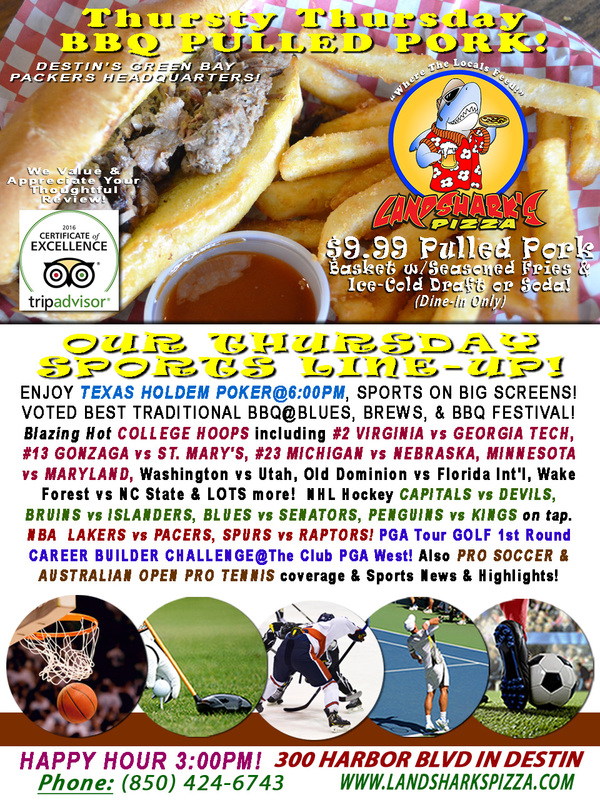 SPORTS ON OUR ARMY OF BIG SCREENS – Fastbreak NCAA #1 VILLANOVA vs GEORGETOWN, ALABAMA vs #17 AUBURN, TEXAS vs #8 TEXAS TECH, #11 XAVIER vs ST. JOHN’S, #21 Tennessee vs Missouri, USF vs East Carolina, UNLV vs New Mexico, #14 Arizona vs California & LOTS more! NHL hugfest CANADIENS vs BRUINS & PENGUINS vs DUCKS! Runnin’ & Gunnin’ NBA action WARRIORS vs BULLS, HAWKS vs PELICANS, SPURS vs NETS, LAKERS vs THUNDER, Knicks vs Grizzlies, Jazz vs Kings, Pistons vs Raptors & Wizards vs Hornets on tap! There’s also PRO SOCCER & AUSTRALIAN OPEN PRO TENNIS plus plenty other Sports Broadcasts, Sporting News, Analysis, and Commentary! Pro Golf This Week: Career Builder Challenge@The Club PGA West (Thurs). Pro Football This Week: AFC & NFC Conference Championships (Sunday) Patriots vs Jaguars & Vikings vs Eagles! 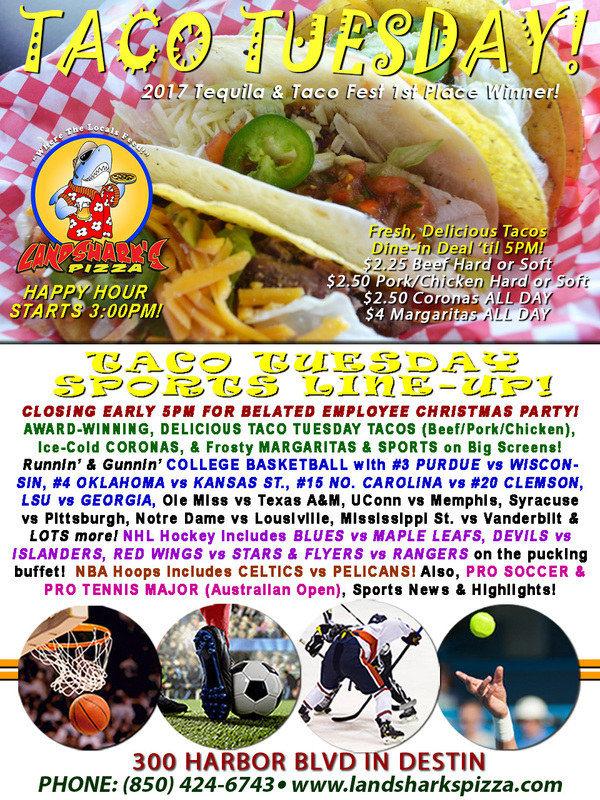 Previous Post: « Taco Tuesday BLAZING-HOT COLLEGE HOOPS Action, NBA, NHL|Taco, Margarita, & Corona Specials!